Synopsis: Ray Ferrier is a working class man living in New Jersey. He's estranged from his family, his life isn't in order, and he's too caught up with himself. But the unthinkable and, ultimately, the unexpected happens to him in an extraordinary sense. 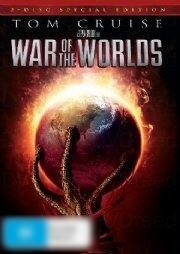 His small town life is shaken violently by the arrival of destructive intruders: Martians which have come en masse to destroy Earth. As they plow through the country in a wave of mass destruction and violence, Ray must come to the defense of his children. As the world must fend for itself by a new and very advanced enemy not of this world, it's inhabitants must save humanity from a far greater force that threatens to destroy it. Please note. Postage rates that I have stated are for New Zealand Delivery only. I do not ship overseas.